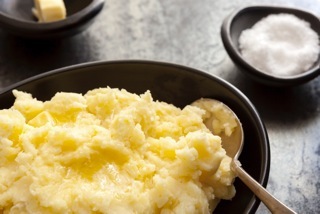 " No matter which way you like your mashed potatoes, this recipe will deliver perfect, garlicky results - every time." 1. Place cut potatoes in a large pot and submerge in cold, salted water (for a flavour boost, use chicken or vegetable broth in place of water). Cover and boil on medium high for 20-25 minutes or until fork tender. Drain. 2. 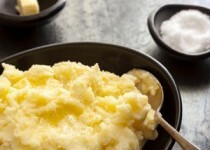 While potatoes are cooking, mix Garlic Mashed Potato Seasoning and melted butter in a small bowl and let sit. 3. Either mash with a potato masher or beat with an electric mixer on low speed. 5. Garnish with fresh parsley, if desired and, season to taste with freshly ground pepper and salt.